Before you grab your ice-fishing gear and head to the lake, do a little research on the fish you are trying to catch and where they spend their time. What do they eat? Where do they live? Do they tend to like deep or shallow areas? After you conduct your research (a visit to a local bait shop IS research…), create an ice-fishing action plan that includes the bait and tackle for the fish (like walleye) you want to land. 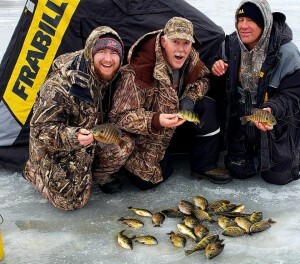 Whether you’re fishing perch or walleye, mastering ice fishing jigging techniques is crucial to your success. After you finish watching Captain Greg Karch’s video on how to jig while ice fishing, get out on the ice and start practicing! Learning how to be patient when ice fishing is a must-have skill. It might take a little longer to get a bite because fish have less energy when it’s cold out, but don’t give up! Practice patience and you’ll start catching fish in no time (ok, you may need to wait awhile before you get a bite on your line). This includes the correct footwear, a hat and gloves (pro tip: bring two pairs of gloves in case the first pair gets wet), heat packs, and layered clothing. If you start to get too cold, it’s time to head back inside. Bringing a friend gives you an extra hand or someone to call for help if something goes wrong. Check out ice guideline safety here. You should always bring along an ice spud or chisel to test the ice thickness. Bringing the right equipment on your ice fishing trip is important if you or someone else falls through the ice. Safety gear you should always bring with you includes a whistle, ice spuds, life jacket, rope and ice cleats. Watch Captain Greg’s ice fishing safety video to review more tips on how to stay safe while out on the ice!